In 1971 Mustang models, Ford changed up the design of the Mustang line a bit for the second generation of the Mustang line, making it longer and wider than ’70 Mustangs, creating an illusion that came off as even more low-slung and road-hugging than earlier ‘Stangs. The 1971 Mustang Grande: The Grande was considered the luxury model of this line, and according to My Classic Garage, buyers had more options with the Grande; like a Landau top, power windows, rear window defroster, and any of the available ’71 Mustang engine options. 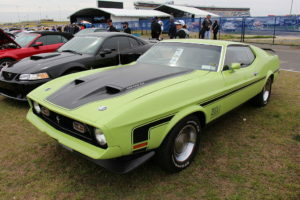 The 1971 Mustang Mach 1: The Mach 1 had a honeycomb grille, Mach 1 decals on rear and fenders, and it came standard with the base 302cid V-8 Windsor engine and a 2-barrel carb – followed with the 351 Cleveland 2-V, 4-V, CJ (Cobra Jet), SCJ (Super Cobra Jet), and HO. The 1971 Boss 351: The Boss 351 featured the 351cid V-8 engine that delivered a solid 330-horsepower response when you hit the accelerator. There were 36,499 two-door Mustang Mach 1’s produced in 1971. 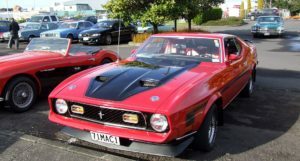 If you take a look at the hood on the Mach 1, (either one of the images above) you’ll see one of the distinguishing features of second gen Mustangs, the NACA (NASA) dual scoops. Some of these dual scoops were decorative-only while others featured a Ram-Air system that let the scoops’ flap open to send cool air to the carb via a fiberglass plenum. While they were an option on all of the second gen Mustangs, the dual scoops were only standard on the Boss models. So… I hope you weren’t too bored with these general facts about the 1971 Ford Mustang Mach 1, and if you’re still with me, be sure to visit the Classifieds page here on the site, sign up for free email updates (the link is on the right side of the screen, near the top), or browse around a bit to see what else interests you – and if you use Facebook, be sure to visit and like the Classic Cars Online US Facebook page. Thanks for visiting Classic Cars Online US.